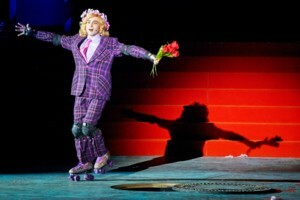 As rollerskating Freddy in Theater Augsburg's My Fair Lady. Looking back on the history of opera, you may think nothing has changed. Maybe it has taken a bit longer, but modern productions of opera are trying to be as dynamic and inventive as musicals or spoken theatre. In fact, they have to be otherwise they will look boring and old fashioned amongst other contemporary theatre. My Fair Lady is not an opera you might argue. But in Theater Augsburg, it is being presented by an opera house features two in-house opera singers in leading roles and almost every featured role was taken from the opera chorus. The director is somebody who has also extensively worked with opera. However we are also working with fabulous actors, extras, stuntmen, ballet, dogs, horses, cars and coaches. We are singing, acting, dancing and doing some stunts. It is quite a show and something that I am very exciting to be doing as an opera singer. The surprises started a few days before rehearsals started when I received a phone call to ask whether I could drive a car. In the first rehearsal I got a bit of a shock: my costume drawing showed Freddy wearing roller skates. Daunting as this sounds, I was excited about the possibilities of doing all these things on stage as an opera singer. In the end, instead of a car I ended up riding a Vespa onstage (with Mrs Eynsford-Hill sitting behind me) and roller skating whilst singing my famous song On the streets where you live (In der Straße wohnst du). Other singers are doing quite complicated dance routines with the ballet, tap dancing and other stunts and gags. 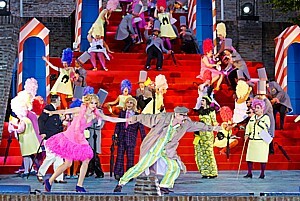 The Ball Scene in Theater Augsburg's My Fair Lady. You may say, "Hang on a minute! I can't dance. I can't rollerskate.". And believe me, lots of opera singers do this! But I chose to take on the challenge, thinking if I worked hard enough I could pull it off.  This scene sticks in people's minds exactly because it is out of the ordinary. Here is a not-too-well-kept secret: I have never ridden a Vespa and I've never rollerskated before My Fair Lady. I received my pair of skates three weeks into production and I practiced one to two hours a day (on top of the rehearsal schedule) to get comfortable enough on them. If you think this is a lot of work, looking back fifty years this is actually nothing compared to the amount of hours Gene Kelly used to put into his routines. I didn't say no: I saw the potential in the scene and I went for it. Having briefly studied tap dancing (yes I actually took dance classes! ), and being inspired by Gene Kelly, I've even managed to incorporate a few tap steps into my skating routine. Ascot Races - Theater Augsburg's My Fair Lady. The Vespa came the day before the piano dress rehearsal - I had a little practice then I was driving through the chorus the next day on-stage. I've used a lot of different skills, some that I already had, but much of it learned on the job. As Woof, I played the guitar but I had to also learn to play the harmonica in Hair. I have always been a terrible dancer, yet I have had to learn to look good while dancing in several operas (as Fatty in Aufstieg und Fall der Stadt Mahagonny for example) as well as musicals. Thankfully, through my limited dance training, I know the terminology and the basic steps. If I ever grumble about it, I remember what a lot of film actors have had to go through - sometimes in equally short and stressful. In Lord of the Rings for example, the actors were training for months to sword-fight and horse-ride, but Viggo Mortensen was cast very late and had to train while he was filming and learning the role. You don't learn these things without a lot of work, which is what makes them special when they are done on stage! 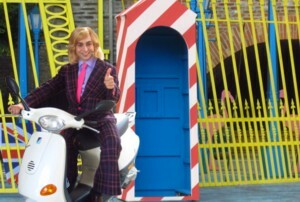 Freddy with his Vespa in Theater Augsburg's My Fair Lady. So my point, I feel that opera is a much different art form than what people seem to expect. Perhaps it is the influence of Wagner, who thought Opera needed to be a complete music drama, but I find it more exciting when all the elements becoming equally important. Singing a role from an actor's standpoint, which means doing everything that an actor might do, influence of lighting, sound and stage effects and combining singing with ballet, puppetry and whatever other dramatic elements that are being used in theatre today. I think this what he envisioned and is more exciting for everybody as a result!